TSPSC Sanitary Inspectors, Health Assistants, Field Assistants Answer key 2018: TSPSC Sanitary Inspectors, Health Assistants, Field Assistants Hall tickets 2018: Applications are invited Online from qualified candidates through the proforma Application to be made available on Commission’s WEBSITE (www.tspsc.gov.in) to the post of Sanitary Inspector in MA and UD, Health Assistant in MA and UD and Field Assistant in TSDDCFL in the State of Telangana. Telangana State Public Service Commission (TSPSC) has notified recruitment for Field Assistant, Health Assistant and Sanitary Inspector posts. TSPSC has released the Sanitary Inspectors, Health Assistants, Field Assistants Preliminary Answer keys 2018 on commission's website. Candidates who were appeared for this recruitment can download their Preliminary Answer keys and bring to the examination. Step 7: Your Preliminary Answer keys would be appeared and downloaded it, take a print. Online application submission process for the posts will begin on August 3, 2018. For Sanitary Inspector post the application portal will open on July 31, 2018. Candidates can submit their applications at tspsc.gov.in. TSPSC will conduct computer based test or offline OMR based exam for selecting candidates. Applicants will be in the age group of 18-44 years. 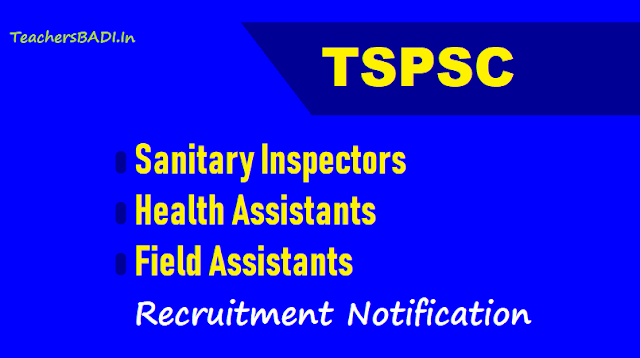 TSPSC has released the Sanitary Inspectors, Health Assistants, Field Assistants Hall tickets 2018 2018 on commission's website. Candidates who were applied for this recruitment can download their hall tickets and bring to the examination. Step 4: In this hall ticket page, Click on the link of "Hallticket Download for Notification No's from 19/2018 to 28/2018 (Sanitary Inspectors, Health Assistants, Field Assistants)". Step 7: Your Hall ticket would be downloaded and take a print. (Remittance of Fee) Each applicant must pay Rs. 200/- (RUPEES TWO HUNDRED ONLY) towards Online Application Processing Fee. This apart, the applicants have to pay RS. 80/- (EIGHTY RUPEES ONLY) towards Examination Fee. However, the following category of candidates are exempted from payment of Examination fee. The fee once remitted, shall not be refunded or adjusted under any circumstances. Failure to pay the examination fee, application fee, wherever applicable will entail total rejection of application. The list of Banks providing service for the purpose of online remittance of fee is given in ANNEXURE – II. The payment of Fee will not be accepted after 11:59 P.M of last date for submission. The Candidateas who were applied for this posts, they can download from the official website. The Examination is likely to be held on View Exam dates from here The Commission reserves the right to conduct the Examination either COMPUTER BASED RECRUITMENT TEST (CBRT) or OFFLINE OMR based Examination of objective type. Before applying for the post, candidates shall register themselves as per the One Time Registration (OTR) through the Official Website of TSPSC. Those who have registered in OTR already, shall apply by login to their profile using their TSPSC ID and Date of Birth as provided in OTR. i) The Applicants have to read the User Guide for Online Submission of Applications and then proceed further. IV STEP: The applicant should pay the prescribed fee as specified through any of the four modes of payment online. Separate instructions have to be followed for each mode of payment.